Our Wild Bird Care department caters for all your feathered garden visitors. Thanks to our selection of feeds and accessories, you'll be able to attract a range of different birds no matter the time of year. We stock premium wild bird seed including special mixes such as no-grow and high energy, as well as feed targeted at individual species. If you are looking for straight feeds then we also have peanuts, sunflower hearts and nyger seed, just to name a few...and don't forget the suet balls! There are also plenty of accessories available to make life for your garden birds that little bit more comfortable. Besides the necessary feeders, we have nesting boxes, bird baths, bird tables, and feeding stations. Scroll down to browse all our online wild bird stock, or filter the list of products using the categories below. 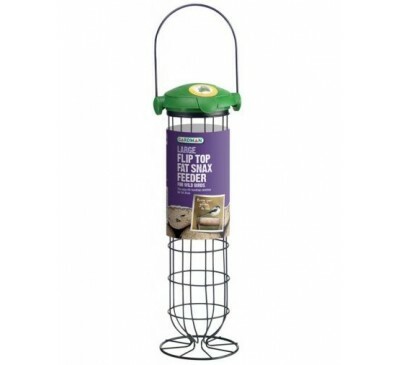 The Complete Feeding Station Kit contains everythi..
No Grow Seed Mix by Gardman is a premium seed blen..
Gardman Seed Mix in an all-purpose seed blend desi..
Our Gardman flip top feeder range offer extremely ..